PITCH - M12 X P1.25. STYLE - CLOSE END MATERIAL - A7075 T6 (LASER MARKINGS). SIZE OF LUG NUT: WIDTH 25mm / LENGTH 42mm / DIAMETER OF KEY 26mm. MADE FROM JAPAN FORGED DURALUMIN, EACH LUG WEIGHT 1 OZ. WILL FIT MOST TUNER WHEELS AND SOME STOCK WHEELS WITH ACORN, CONICAL, OR TAPERED SEATS. 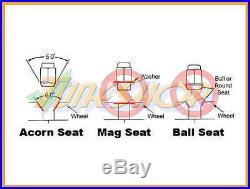 PLEASE CHECK THE DIAGRAM BELOW TO CONFIRM IF YOUR WHEELS ARE " ACORN SEAT ". COMES WITH 4 WHEELS LOCKS FOR ANTITHEFT SECURITY. 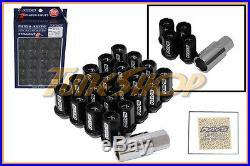 THIS KIT INCLUDES 20 PIECES LUG NUTS / LOCK NUTS AND INCLUDED ONE SECURITY KEY. 100% BRAND NEW, AUTHENTIC RAYS/VOLK RACING DURA LUG NUTS MADE IN JAPAN. FITS NISSAN, INFINITI, SUBARU, SUZUKI AND OTHER CAR MAKES. MADE SURE YOU ARE PURCHASING 100% AUTHENTIC RAYS JAPAN PRODUCTS AT THIS PRICE. IF YOU HAVE ANY QUESTION ABOUT THE FITMENT OF YOUR WHEELS OR TREAD PITCH OF YOUR CAR. 100% AUTHENTIC PARTS / GUARANTEE INSTOCK. ANY DAMAGE OR NOT RECEIVED OF PACKAGE HAS TO BE REPORTED TO US & THE CARRIER. PLEASE INSPECT THE ORDER IMMEDIATELY UPON RECEIPT. USER ASSUMES ALL RISKS & COSTS ASSOCIATED WITH THE USE OF THESE PARTS & ACCESSORIES. Powered by SixBit's eCommerce Solution. The item "VOLK RACING RAYS STRAIGHT L42 DURA WHEELS LOCK LUG NUTS 12X1.25 1.25 RIM BLACK U" is in sale since Wednesday, August 24, 2016.